Another beautiful race day in the books. I'm sunburned and sleepy this evening, but I wouldn't have missed it. It started slow, with a multi-car crash a mere three seconds after the green flag was raised. After several laps under the yellow, I thought maybe my last minute choice this morning to grab a yellow belt over a green one was a jinx... But, it ended up being a nail-biter at the end, with quite a bit of screaming and jumping up and down by yours truly. I drew Scott Dixon in our annual pool, and even with three laps left to go, I really thought he might be the 99th winner of the Indy 500. Alas, Juan Pablo Montoya took the checkered flag, but it didn't dampen my enjoyment of the race. My friend (and Pariah5K fashion designer) Barbara Riordan looks chic in red accented with her own checkered flag pin and fingernails. Speaking of the checkered flag, I usually wear black and white on race day, and last year sported the iconic checks on my fingernails and flipflops. But this year's sundress was, admittedly, (perhaps) a little over the top. Then again, I am who I am, and I loved the dress. It's lightweight cotton perfect for a hot day; it's as comfortable as shorts and t-shirt; and it's just, well, me. Staying true to my personal style also meant that local fashion designer and fellow fashionista Barbara Riordan (check out her work here), recognized me almost immediately from several bleachers away. 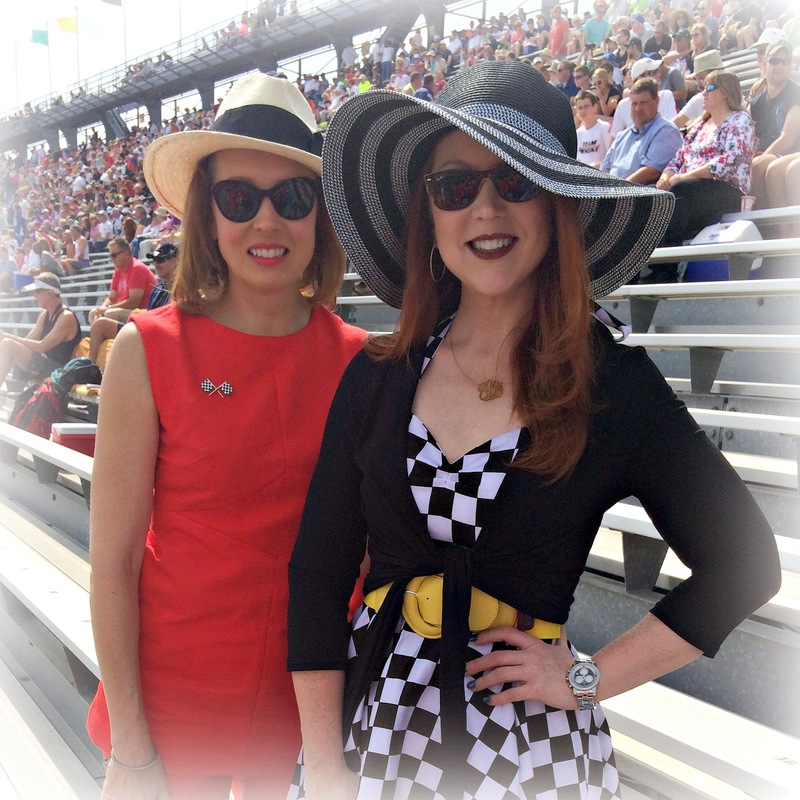 It was a treat to find out we've both been coming to the race and sitting in the same section for years! 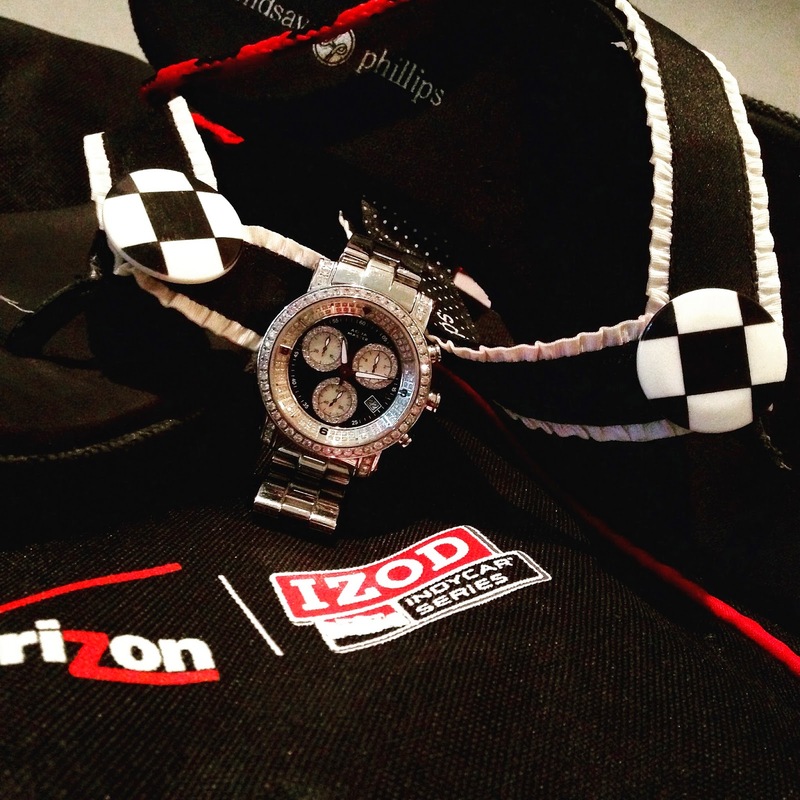 The Izod IndyCar Series backback was a favor from a race event a few years ago, and I've put it to good use; Lindsay Phillips Switchflops are the only flipflops I wear - the checkered flag straps are infinitely interchangeable to match any outfit; the watch is from AquaMaster. Race day is a long one, so my gear has to be practical, too: a small backpack takes the place of a purse; comfortable flipflops make the mile plus walk to and from the car an easy one; and a hat helps keep me out of the sun (though I still always end up a little pink, even with SPF 70). 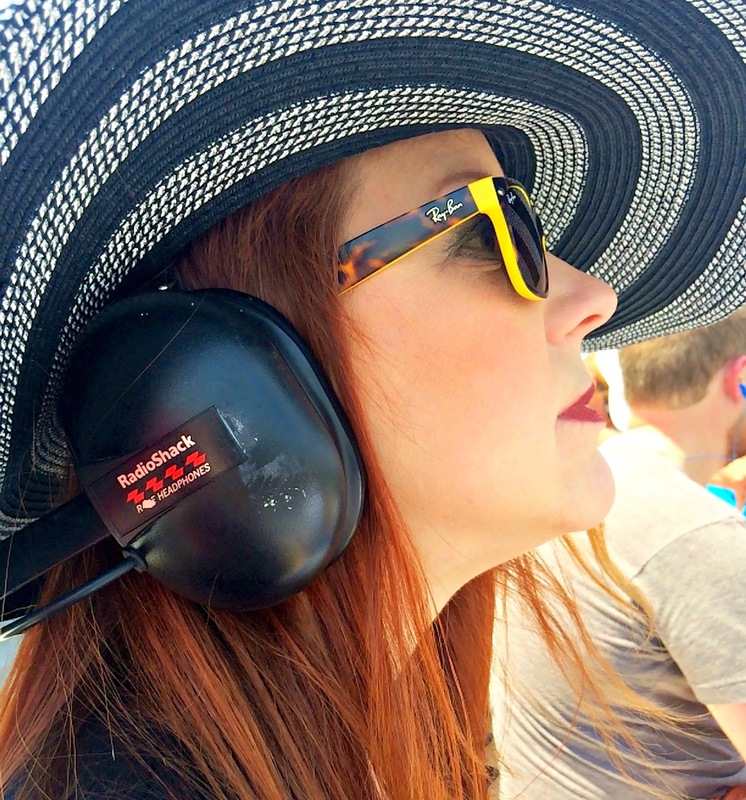 Headphones and a race scanner are also key, both to protect my ears from the constant barrage of high decibel engine noise, and because I love tuning in to the behind the scenes chatter and strategizing of the various race teams. I'm already looking forward to the 100th running of the Indy 500 next year! For an adventure in fabulous headwear, check out Hat Attack by The Style Crone.